The 10-year US Treasury Note is a debt obligation that is issued by the Treasury Department of the United States Government and comes with a maturity of 10 years. It pays interest to the holder every six months at a fixed interest rateInterest PayableInterest Payable is a liability account shown on a company’s balance sheet and represents the amount of interest expense that has been accrued to date but has not been paid as of the date on the balance sheet. It represents the amount of interest currently owed to lenders and is typically a current liability that is determined at the initial issuance. 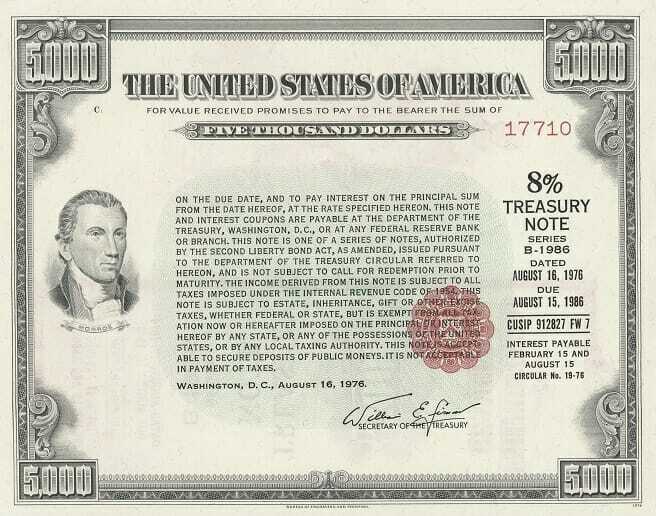 The US Government pays the par valuePar ValuePar Value is the nominal or face value of a bond, or stock, or coupon as indicated on a bond or stock certificate. It is a static value determined at the time of issuance and unlike market value, it doesn’t fluctuate on a regular basis. of the note to the holder at the expiry of the maturity period. The issuer uses the funds collected to fund its debts and settle ongoing expenses such as employee salaries and equipmentPP&E (Property, Plant and Equipment)PP&E (Property, Plant, and Equipment) is one of the core non-current assets found on the balance sheet. PP&E is impacted by Capex, Depreciation and Acquisitions/Dispositions of fixed assets. These assets play a key part in the financial planning and analysis of a company’s operations and future expenditures. 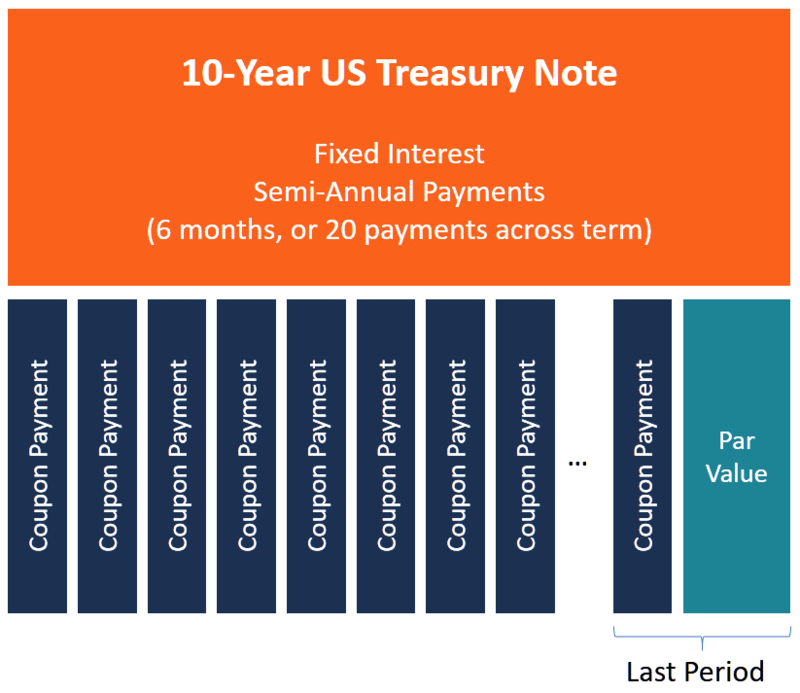 Treasury notes are issued for a term not exceeding 10 years, and the 10-year US Treasury note offers the longest maturity. Other treasury notes mature in 2, 3, 5 and 7 years. Each of these notes pays interest every six months until the maturity period expires. The 10-year treasury note pays a fixed interest rate that also guides other interest rates in the market. For example, it is used as a benchmark for other interest rates such as Treasury bonds and mortgage rates. One exception is the adjustable rate mortgages that are guided by the federal funds rate. When setting the federal funds rate, the Federal ReserveFederal Reserve (the Fed)The Federal Reserve, more commonly referred to The Fed, is the central bank of the United States of America and is hence the supreme financial authority behind the world’s largest free market economy. takes into account the current 10-year treasury rate of return. The yield on the 10-Year Note is the most commonly used Risk-Free Rate for calculating a company’s Weighted Average Cost of Captial (WACC)WACCWACC is a firm’s Weighted Average Cost of Capital and represents its blended cost of capital including equity and debt. The WACC formula is = (E/V x Re) + ((D/V x Rd) x (1-T)). This guide will provide an overview of what it is, why its used, how to calculate it, and also provides a downloadable WACC calculator and performing Discounted Cash Flow (DCF)DCF Model Training Free GuideA DCF model is a specific type of financial model used to value a business. DCF stands for Discounted Cash Flow, so the model is simply a forecast of a company’s unlevered free cash flow discounted back to today’s value. This free DCF model training guide will teach you the basics, step by step with examples and images Analysis. The 10-year US treasury can be purchased at auctions through competitive and non-competitive bidding. It is one of the most popular and most tracked debt instruments compared to other treasury bills and treasury bonds, and it is seen as one of the safest investments since it is backed up by a guarantee from the US Government. Even though the U.S. debt is more than 100% debt to GDP ratio, the government is less likely to default on its obligations. Hence the note is attractive to investors. Investors who buy treasury notes can choose to hold them until maturity or sell them on the secondary market. The US Treasury does not impose limitations on how long investors can hold these investments. Unlike treasury notes with short maturities of 2 to 7 years that are issued every month, the 10-year US Treasury notes are issued in February, May, August, and November. The reopening of the 10-year Treasury notes occurs in the remaining months, with maturity dates and interest rates being similar to the treasury bills issued during the other months. When markets are volatile, there is a high demand for 10-year US treasuries as investors look for safe investments that will earn them interest. When the debt instruments are sold at auctions by the US Treasury, the high demand pushes investors to bid at or above the par valuePar ValuePar Value is the nominal or face value of a bond, or stock, or coupon as indicated on a bond or stock certificate. It is a static value determined at the time of issuance and unlike market value, it doesn’t fluctuate on a regular basis.. The investors are primarily looking for safe investments that will safeguard their funds, even though their yield is low. The yield is low because the rate of return falls during the recession phase of the business cycle. As a result, the low 10-year Treasury interest rate will cause a reduction of interest rates of other debt instruments. On the other hand, during an expansion phase of the business cycle, there is a low demand for 10-year Treasuries since other debt instruments are more attractive. In such a case, investors look for high return investments as opposed to safe investments. Since treasuries provide a low rate of return, the investors will put their money in alternative investments that will give them a high yield. The practice lowers the demand for 10-year T-notes. Investors interested in 10-year T-notes will bid at a price lower than the face value of the note. Therefore, there will be higher returns on their investments and investors will be expecting to get a high yield at maturity or when they sell their investments in the secondary market. The demand for 10-year Treasury Notes directly affects the interest rates of other debt instruments. As the yield on 10-year T-notes rises during periods of low demand, there will be an increase in interest rates on longer-term debts. The longer-term debts that are not backed by the US Treasury must pay a higher rate of interest than the treasuries to compensate investors for the high risk of default that comes with investing in these securities. Similarly, if the yields on 10-year Treasury Note fall, the interest rate on the less secure investments will decline but remain above the treasury interest rate. It allows them to stay competitive and compensate the investors for taking additional risks when they could’ve invested in government-backed investments. The 10-year note is what most professionals in investment bankingJobsBrowse job descriptions: requirements and skills for job postings in investment banking, equity research, treasury, FP&A, corporate finance, accounting and other areas of finance. These job descriptions have been compiled by taking the most common lists of skills, requirement, education, experience and other, equity research, corporate development, financial planning and analysis (FP&A)FP&AFinancial Planning and Analysis (FP&A) is an important function at a corporation. FP&A professionals support executive decision making for the CEO, CFO and Board of Directors with planning, analysis, and modeling. Learn what the job of an FP&A analyst, manager, or director entails - salary, requirements, education, skills, and other areas of finance use. When calculating a company’s WACC, one of the assumptions that must be made in the cost of debtCost of DebtThe cost of debt is the return that a company provides to its debtholders and creditors. 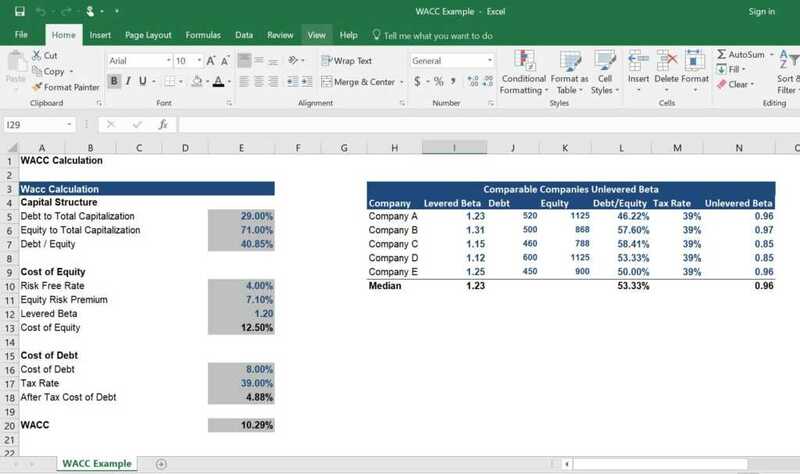 Cost of debt is used in WACC calculations for valuation analysis. Learn the formula and methods to calculate cost of debt for a company based on yield to maturity, tax rates, credit ratings, interest rates, coupons, and is the “risk-free rate,” which is usually equal to the yield on the 10-Year Treasury. In cell E15 above, the cost of debt is equal to the yield on the 10-year treasury. Learn more in CFI’s financial modeling and valuation courses. The 10-year US Treasury Note is used to show investor confidence in the state of the economy. When the investors have high confidence in the performance of the economy, they look for investments with a higher return than the 10-year Treasury Note. It triggers a drop in the price of the T-note since investors are interested in earning higher returns more than the safety of their investments. On the contrary, when investors have low confidence in the state of the economy, the demand for safer government-backed 10-year T-notes increases, resulting in a price increase. The prices of the less secure investments will decline because of their high risk of default. The 10-year US T-note is one of the most tracked treasury yields in the United States. Investors can assess the performance of the economy by looking at the Treasury yield curve. The yield curve is a graphic representation of all yields starting from the one-month T-bill to 30-year T-bond. The 10-year T-note is located in the middle of the curve, and it indicates the amount of returns that investors need to tie their money to for 10 years. If they predict an expansion in the next 10 years, investors will require a high return on their money. However, if they anticipate that a recession will occur in the next decade, they don’t require a high return to keep their money safe.